The stage is set. Three claw-footed bathtubs. The kind your grandmother had. Props. Three scrub buckets, newspapers and a tea set. Costumes. Bridal gowns and veils, usually sopping wet. 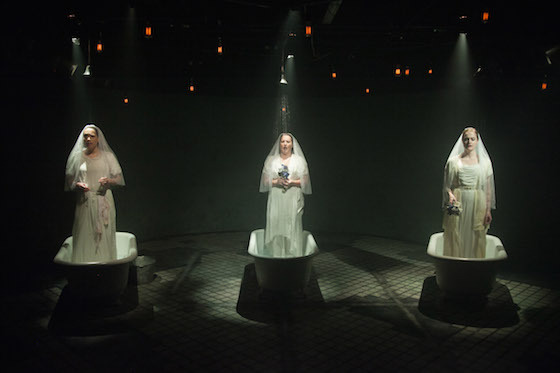 If this doesn't sound like a promising start for a night at the theater, The Drowning Girls at Signal Ensemble Theatre will quickly change your mind. The play is a beautifully performed, balletic story of an English serial killer in the 19th century, who swindled from and then drowned his three wives. Actually, it's the entrancing story of the three wives, who perform all the parts in the play from the brides submerged in their tubs to the husband(s), parents, lawyers, judge, reporters and scrubwomen. They re-enact their meetings, weddings and deaths, and their characters spur an investigation that leads to the murder conviction of George Joseph Smith, whose crimes were called the "Brides in the Bath Murders." He wooed the daughters of wealthy families and managed to have the women's inheritances or savings signed over to him and insurance policies signed to his benefit. Director Melanie Keller does a masterful job of choreographing the three wives, who are played with perfect timing, subtle gestures and accents as they change characters. 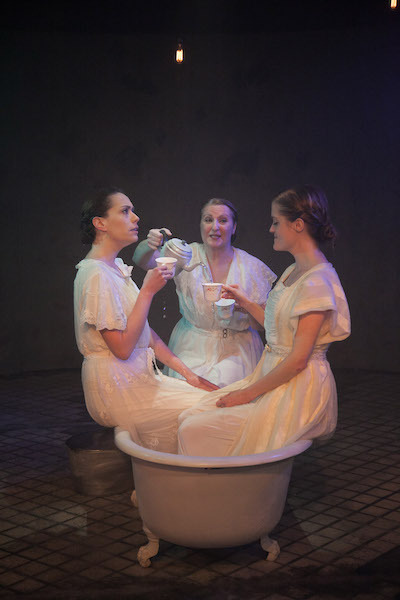 From left to right in their tubs, they are Katherine Schwartz as Bessie, Anne Sheridan Smith as Margaret, and Meghan Reardon as Alice. Signal's production is the Chicago premiere of a script by playwrights Beth Graham, Charlie Tomlinson and Daniela Vlaskalic, Canadian theater artists, whose play was first performed in 2008 in Alberta. Their script is poetic prose and requires the actors to speak in lists, finish each others' sentences and read their own obituaries from the wet newspapers they bring out of their tubs. The brides are a bit older and realize they must marry because they have no other options. This exchange explains why. ALICE: Can't vote. Can't own property. Can't show an ankle. Can't have an opinion. Can't breathe in this dress. BESSIE: That's the way the world is. BESSIE: Why would you want to? BESSIE: You must call it a limb. ALICE: We can't do anything that isn't ladylike? Can't, can't, can't. I'm so sick of being a lady. BESSIE: You'll be happy when you're married. The 70-minute production is notable for the simplicity and effectiveness of its staging, designed by Buck Blue, and Michael C. Smith's lighting. Rachel Lambert's bridal costumes are lovely in the brief time they are dry and look just fine when sopping wet. The production takes full advantage of its watery symbolism. As the play opens, the submerged brides perform a synchronized swimming routine. They sometimes stand under streams of water pouring down from showerheads and hold a tea party in Margaret's tub to discuss the man they met and loved. They jump in and out of their tubs and become scrubwomen and scrub the floor while discussing the crimes. There should be a special Joseph Jefferson Award for actors performing an entire play while sopping wet. The Drowning Girls continues through June 6 at Signal Ensemble Theatre, 1802 W. Berenice Ave. in the North Center neighborhood. 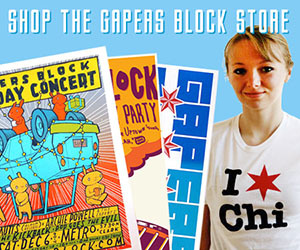 (There's easy, nonpermit, nonpaybox street parking!) 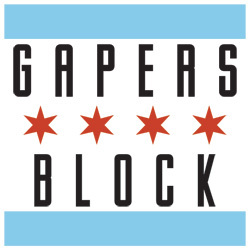 Tickets are $23 and can be purchased online or by calling 773-698-7389.